Make Millions From Your Business will help every entrepreneur not only build a more successful business, but provides the basis for wealth creation. 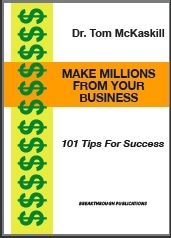 This website has been constructed to allow the free download of a set of eBooks written by Dr. Tom McKaskill (Dr. Exit). eBooks in pdf format may be downloaded and distributed for free. Any organization which wishes to provide any of the free ebooks to their viewers may copy and host the eBooks on their own website. Masterclass for Entrepreneurs - Over 330 published articles assembled in 9 books.